We have family coming in today! And I'm being very helpful around the house. Here's an up-close photo of the edible menorah, in front of our chocolate dreidels - YUM! There's this ginormous bag with OUR name on it that we get to open tonight! Stay tuned for more UPDATES! 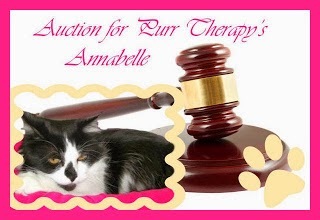 We wanted to take this moment to let you know about an auction for a fellow cat blogger to help her defray medical costs for her sweet Annabelle. Please click the badge below to be directed to the auction site - we've already bid on two pawesome items! The edible menorah looks really cool ! A BIG bag with your name on it ?! What awesome looking edible decor! My human could never do something so fancy. The menorah looks AWESOME! The Human read on CNN that Thanksgiving and the first day of Chanukah won't be on the same day again for 70,000 years! Wowza--I guess everyone better enjoy it this time since I don't think any of us will be around for the next one, eh? Have a fantastic day and let us know what was in the bag! Happy Thanksgiving and Hanukkah to you and all your family. We hope you have a swell Turkey Day. Happy Chanukah to you. The menorah looks great. Happy Thanksgiving also to you and all our US friends. YUM!!! You're food is WAY fancier than ours!!! We hope you have a wonderful day celebrating with family and friends. We're so very thankful for YOU, our sweet friends. ...yes Faraday, that means you too! Eagerly awaiting the news about whats in the bag! Happy Chanukah! What a wonderful Menorah. Happy Chanukah. Holy Cat! Look at that nommy menorah!!! And we bet those dreidels are tasty, too! How fun is the edible menorah!!! Asparegus and green beans? Ugh. It looks pretty though. Happy Hanakkah. Wow! Those are such creative looking noms! We hope you had a wonderful Thanksgiving and Hanukkah! Purrs from the Zee and Zoey Gang!